The first volunteer spotlight is on Binz Chapman. The photo was taken at the volunteering event last Sunday. “I am one of the regular volunteers with Fleet Pond Society (FPS) and have been working with them for about 3 years. Born and raised in the Weald of Kent, I spent a lot of my childhood out in the local countryside, climbing trees, playing in streams and generally coming home wet and muddy. 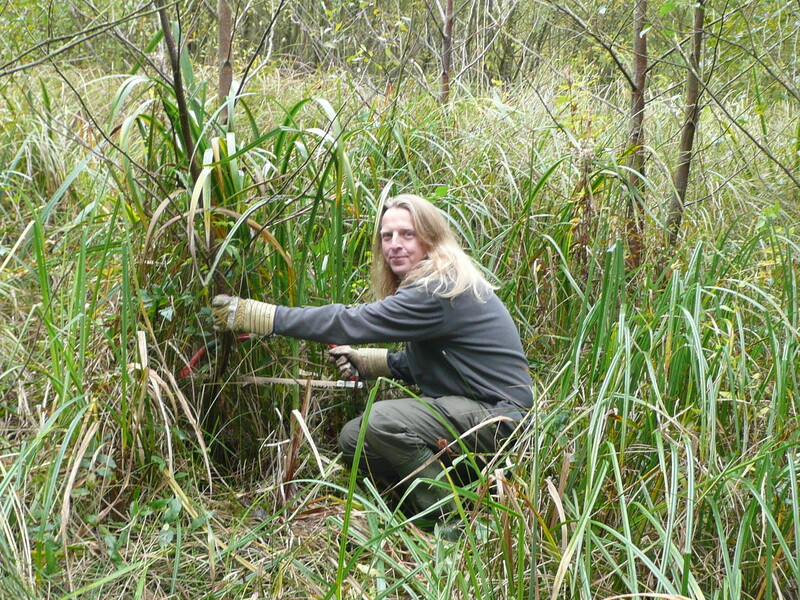 I first got involved in conservation in my twenties, when I joined one of BTCV’s (previously The British Trust for Conservation Volunteers) mid-week volunteer teams during a period of unemployment. That’s when I caught the bug for conservation work, it gave me the satisfaction of doing something positive in my life and put me back in touch with the simple childhood pleasure of being in nature. I now volunteer with both the FPS and also a local Hampshire Wildlife Trust group near my home in North Warnborough. Both have given me a greater knowledge and appreciation of the countryside and wildlife around me. As well as the practical benefits that volunteering brings to the local environment, my employer provides a ‘matched giving’ fund which means that for every hour I spend volunteering they make a financial donation to the charity involved. In my current career (I’m an environmental consultant for a multinational oil company) I spend nearly all my time in front of a computer screen in an office complex with another 4000 of the company’s employees. It’s great to escape from that corporate culture, to be with nature again and to share time with like minded people. This article has been selected to appear in the News section of the BTCV (formerly The British Trust for Conservation Volunteers) website – see here. This entry was posted on Tuesday, October 14th, 2008 at 2:13 pm and is filed under People, Volunteering. You can follow any responses to this entry through the RSS 2.0 feed. You can leave a response, or trackback from your own site. Hi, great inspirational volunteer spotlight. Would you/Binz mind if I shared with a link from the BTCV News page? Best wishes.